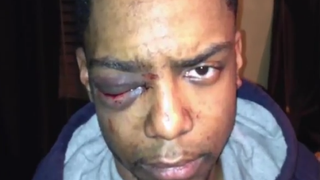 Photo of Taj Patterson taken shortly after the beating he suffered in December. Police arrested five Hasidic men Wednesday in a mob attack against a gay black man in a case that was initially investigated as a bias attack, the New York Daily News reports. After a night of partying last December, fashion student Taj Patterson, 22, told authorities that he was headed to his home in Fort Greene, Brooklyn, when over a dozen ultra-Orthodox men assaulted him while shouting anti-gay epithets. Patterson said he could recall the main instigator kicking him in the face, yelling, "Stay down, f—got, stay the f—k down," as others cheered. Five men have now been charged with gang assault and other charges: Aharon Hollender, 28, Abraham Winkler, 39, Mayer Herskovic, 21, Pinchas Braver, 19, and Joseph Fried, 25, the Daily News reported. None were charged with hate crimes. All five were released on bail. They face up to 25 years in prison if convicted. "We simply cannot allow anyone walking on the streets of Brooklyn to be knocked to the ground, stomped and brutally beaten," Brooklyn district attorney Kenneth Thompson told the newspaper. At least two of the men charged belonged to a volunteer patrol called Shomrim, and were looking for someone they believed vandalized cars in the area when they stopped Patterson, prosecutors told the Daily News. After the attack, Patterson was hospitalized with a broken eye socket, a torn retina, blood clotting, and several cuts and bruises. "These indictments send a clear message that acts of vigilantism are unacceptable and cannot be condoned by the NYPD," Police Commissioner Bill Bratton said in a statement.